Growing cherry tomatoes in containers is similar to growing other tomatoes in pots – or other container gardening, for that matter. It’s easy and fun. Beginners can grow cherry tomatoes in pots with great success! There are a few special pieces of information to know about growing cherry tomatoes in pots – and a couple of myths to dispel. But not all cherry tomato plants are small. Some cherry tomato varieties can grow to be 4-6 feet tall. Certain cherry tomato varieties flourish in containers. Others grow best in the garden. Some cultivars can grow equally well both places. It matters a great deal. Not all cherry tomato varieties will flourish in containers. How do you know which variety to select? It depends on the container you’re using. If you’re planting cherry tomatoes in baskets, choose varieties suitable for hanging containers and that have shallow root systems. 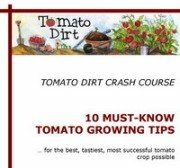 Check out best tomato varieties for baskets to see what types of cherry tomatoes have shallow root systems. 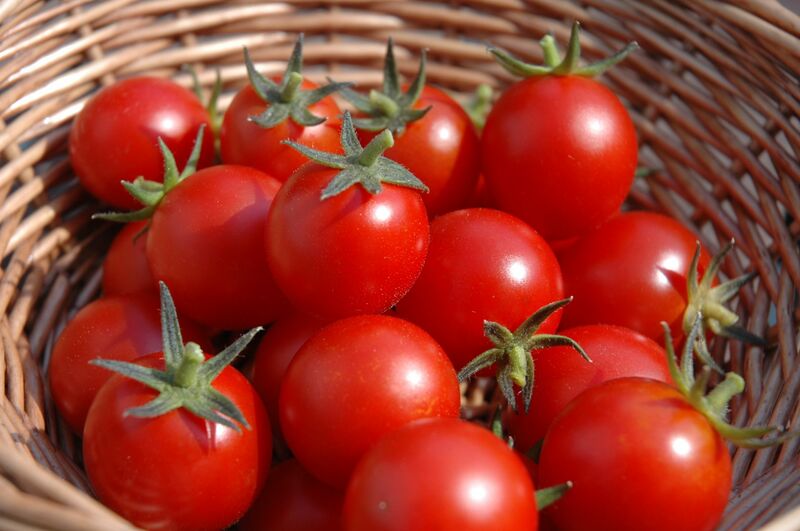 If you’re planting cherry tomatoes in containers or pots, you have more choices. Find out best tomato varieties for small containers and best tomato varieties for large containers. And choose your tomato containers with care, too. Be sure to check a broad selection of tomato pots. Many cherry tomato varieties are determinate, which means their fruit ripens within a short time frame (usually 2-3 weeks.) However, some varieties tare indeterminate. They will continue to produce fruit until frost. You can ensure a long cherry tomato harvest from your containers when you plant different varieties – either determinate or indeterminate – in different containers. Each variety will ripen and be ready for picking on its own schedule, providing you with delicious cherry tomatoes for a long time. Find more tips for growing container tomatoes on our Pinterest board. What potting mix should I use for growing tomatoes in pots or containers?